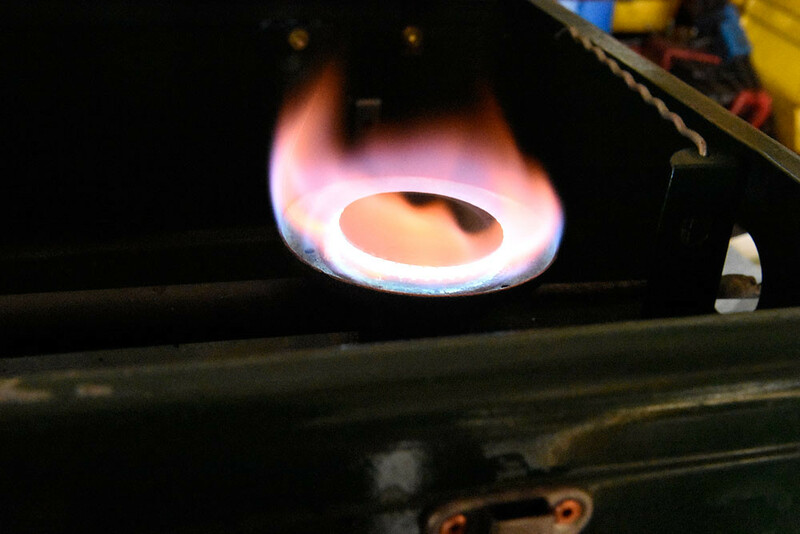 We've had some discussions here regarding the orientation of the rings on a Band-O-Blue stove burner. I decided to do some experiments, as it's a drizzly, gray and lazy day. My experimental subject will be my 426A. It has two secondary burners which should be more or less identical. I'll try the various orientations on them. Next, I'll swap the ring stacks on the two burners to be sure the difference is the orientation. After that, I'll be adding a single wavy and flat ring to one burner t see what that does. Well, that was a waste of time! I was just playing around with one of the ring stacks, and guess what? No mater how you flip the rings, they're the same! To be a little clearer, flipping rings makes no difference. Rotating them does, as far as you can line them up bump-to-bump or bump-to-valley. I wasn't wearing my readers when I took the photos above so I didn't notice this. 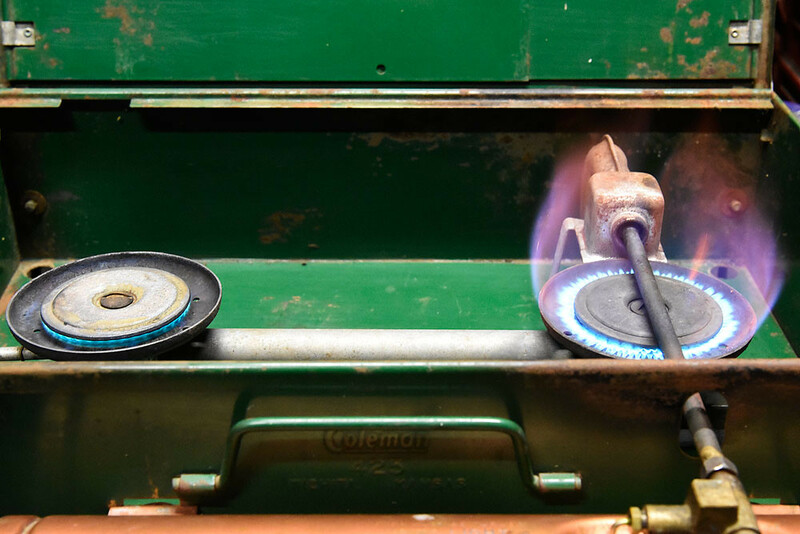 I'll just go right to adding a ring to the burner that had the weaker output. I set my small Sigg Nesting Billy with 20 oz of cold water over the modified burner. Time to full boil: 5:00 minutes. Not I'll let it cool again, remove the extra set of rings, and do the boil test again. The one variable I can't control is pressure. I should have used a Schrader-mod cap so I could get the pressure the same for all trials. Biol time with three pairs of rings: 5:17 minutes. I'll call that a draw. 1) I have too much time to screw around. 2) Metal hot enough to raise a blister on contact looks the same as cold metal. Ouch. 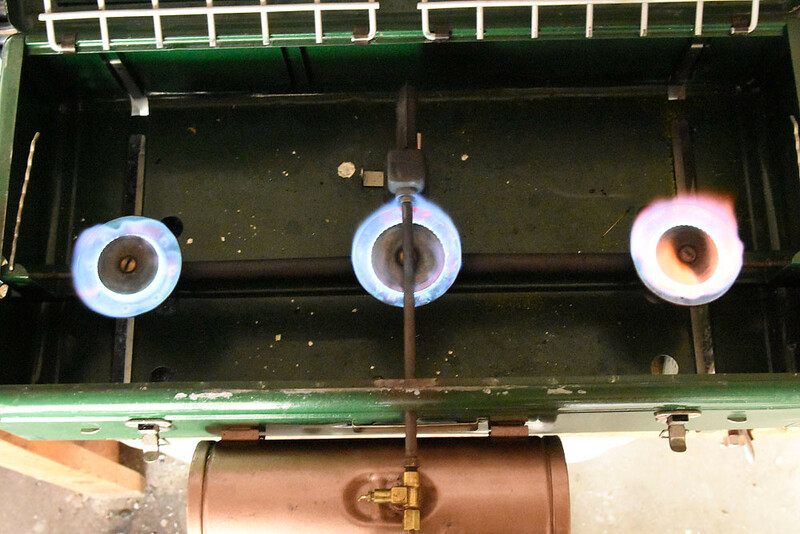 3) I don't use the right-hand burner as much as the other two, so it took a while to burn the light rust off the rings. 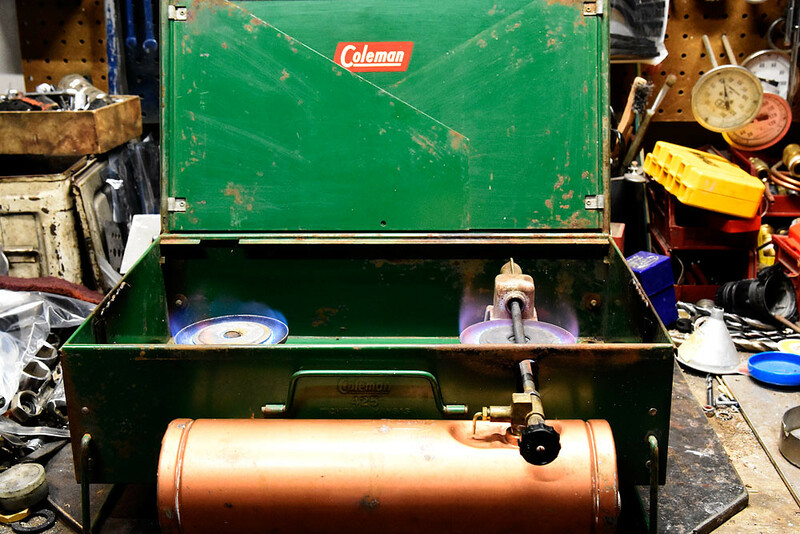 4) Coleman engineers knew what they were doing. Interesting analysis. I like the way the alternate wavy rings look. Robert--get that stove up and running! A 426 is the best of the suitcases in my opinion. Karen--I just don't think it matters. I can't even see a difference looking at them. I had to use an LED flashlight so I could get the pictures--you'll never notice the difference in the field. But it's what pleases you--and me--that matters. Zach--You know, at one time I actually did do real scienteriffic experiments. Now I'm just another hack. But it kept me off the streets (we have three streets) for the day. And I replaced the broken mantles of my 8/44 VJ 220 C with some nice old coarse-weave Silikes while I was at it. My light-up for the night. You ignore the first law of thermodynamics at your peril. Nice post, now we don't have to do that thread once a year. 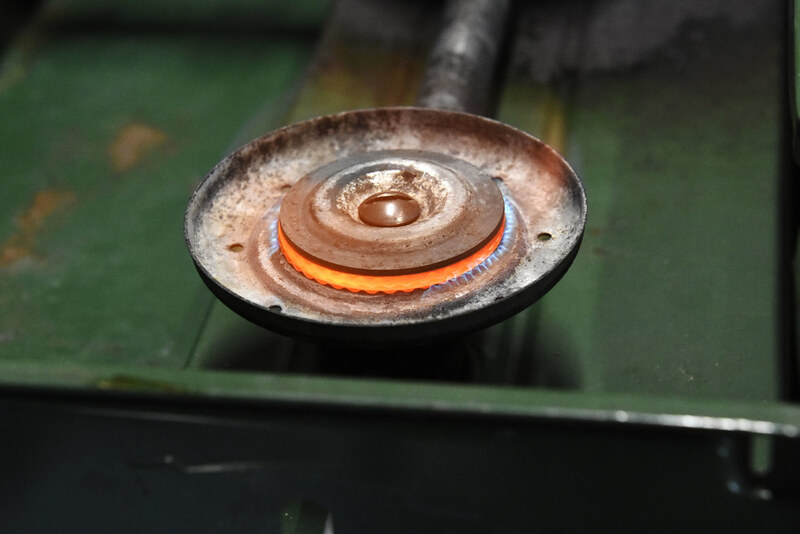 Reese’s Law of Thermodynamics: At temperatures below incandescence hot metal looks exactly like cold metal. Nice post, now we don't have to do that thread for another year. In Timm,s own words when i asked this question and opened this can of worms was. The major axis of the amplitude must be arranged so the vertical polarization of the sinuosity progresses clockwise in synchronization with the minor vibrational harmonic chord of the radial polarization. In other words, nope. Flat ring first, wavy ring, repeat. Is it bad that what Timm said makes sense and I understand it. You also have to make sure that the peaks are alternated as well. Bump so we don't have to go through this again this year! But Timm, you know someone will miss this, and that someone will start a whole new thread on it. I'll try to link this thread in it, and nip the whole thing in the bud. Saved me an hour or two! What shall I do now? 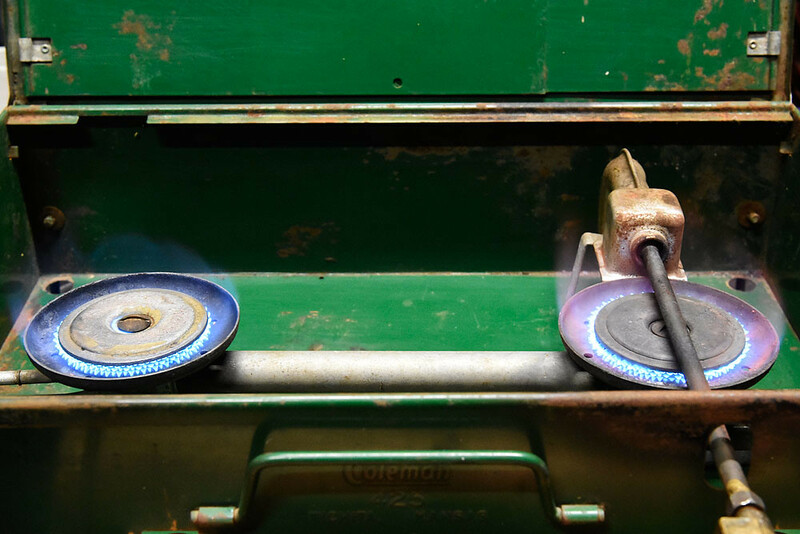 What will happen if you take one ring out of the primary burner? Because I am Dave that's why! But, but, it hasn't even been 6 months! Yeah, well, technically, it's a new year. And it's another wet, drizzly miserable gray day, so I'm going to fool around with burner rings again. I was fixing up a friend's 425F yesterday and apparently got the rings on the aux. 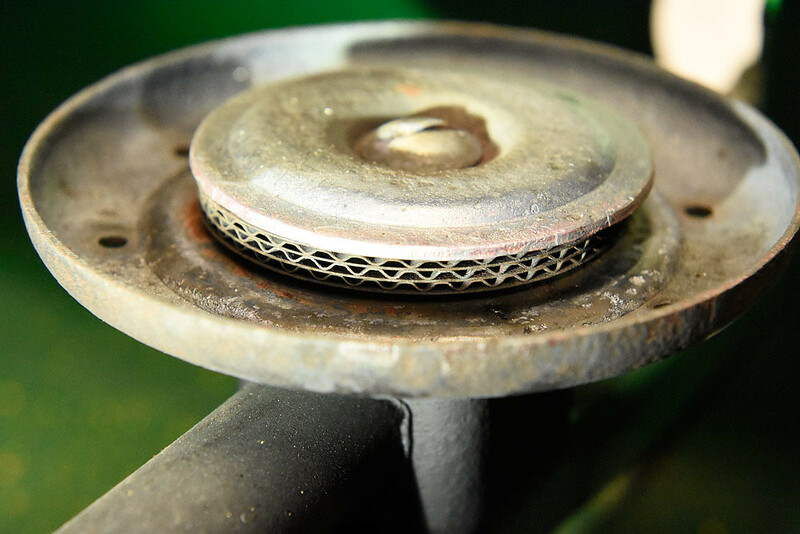 burner started with a wavy ring instead of a flat one. I didn't really think it would make all that much difference. Taking the ring stack off and putting a flat ring on the bottom completely solved that. I have one of my 425s here and it runs great, so I think I'll fool around with ring order this time. Maybe see what happens if I leave the restrictor plate off the main burner? Today's foolin' around with stoves. I have one of my 425NLs here. It's the later version w/gold tank and internal leg retainers. It runs great, so I thought I'd try to screw it up. Hmm... main burner seems to be going fine and strong. Let's see how it works with the aux. burner going too. Looks about the same to me, but I'll leave it the way it was. Lastly, I tried to replicate the glowing burner rings I had yesterday. I removed the bottom flat ring from the aux. burner and lit it up again. I put everything back the the way it was. Amazingly, I managed not to burn myself this time. Maybe old dogs can learn new tricks with pain as an incentive. 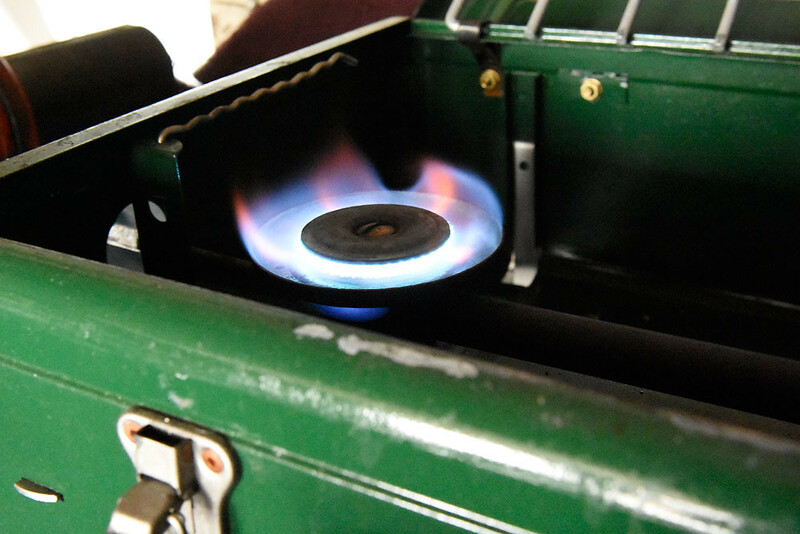 One thing I like about the burner cups on the older suitcase stove like this is the little fingers on the cup (first photo this post). 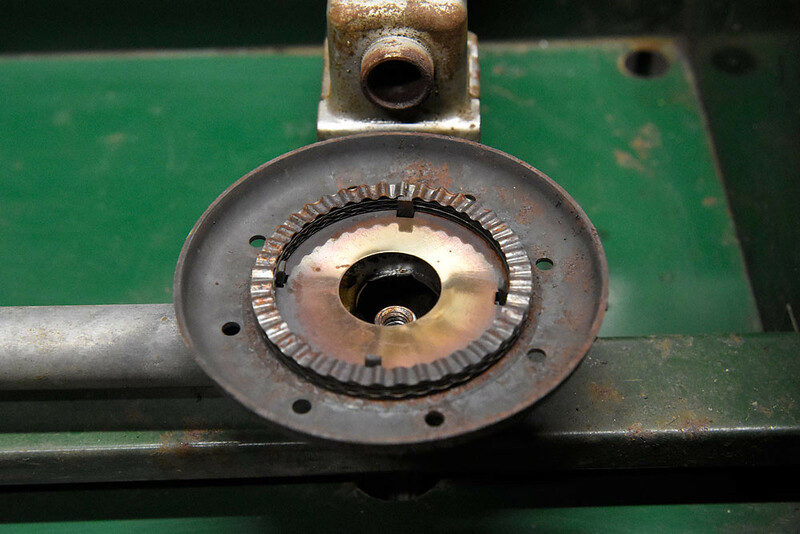 They help to keep the rings centered, and absolutely prevent over-tightening the screws from crushing the ring stack. Coleman should have kept 'em. This 425 is looking for a home if anyone wanders out thisaway this summer. I couldn't pass up a $5 425! It just needs a grate. Okay, now back to your regularly schedule programming. Here is a question - can you drive 2 big burners and get any gain on the left side, without killing off the right? No, that's separate tanks and burners. 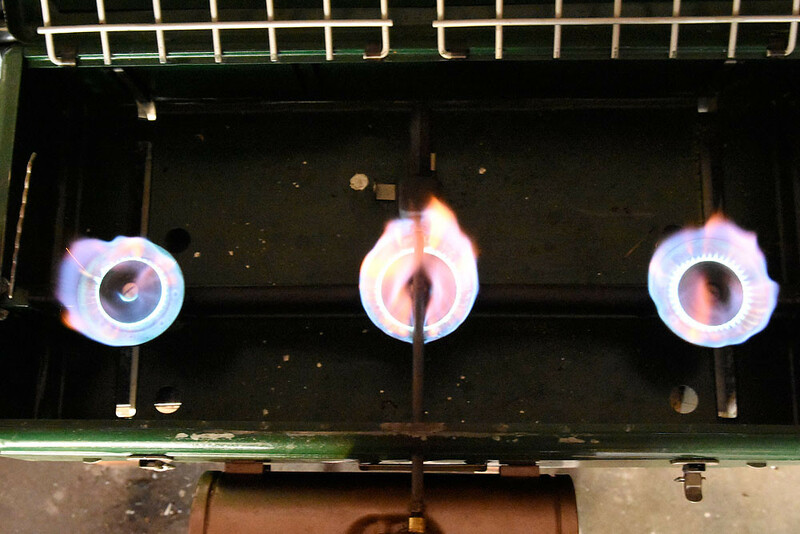 I'm talking about putting a large right side burner from a donor on the left side in an otherwise std configuration. Wonderful! I never noticed that the one on the right was larger. Now I have to go and look at the stoves that I have and see if I put it together correctly. Y'know, Outlaw, I might just give that a try. It'll give me another chance to blister a finger or two! I wonder if going to a 413/426 generator might help--if it'll even fit, which I doubt. Hoping to reach cognitive and emotional maturity before my children do. I don't happen to have another 425 sitting around the shop today, but I do have a 413C, so I borrowed the primary burner from that and swapped it for the aux. on the test 425. I'd say that the generator isn't capable of pushing two full-size burners. The 413 gen is far too long and too fat at the tip, so that idea is out. Interesting note: The 413C burner assy. had no restrictor plate for the main burner. It does have the tabs for the rings. I think Duane had the right answer if you want two main burners. Personally, I prefer the one main for crankin' the heat, and the aux. for fine control. Timm, When you swap it back try the same test. Seems to me the main always suffers a bit when the secondary burner is doing more than a low simmer. Plenty of pictures above with the proper burners both going. What would really tell would be some boil time experiments, but I don't have a grate for this stove and I'm too lazy to improvise right now. I think most if not all of this is covered under Pascal's Law. Now I can't wait for someone here to come up with their 3-burner, 3-tank stove mod. It seems only natural. I think it's covered under subclause B, paragraph 4, section 63.25 of Murphy's Law. Anything that can't go wrong can be made to go wrong with some creativity and simple hand tools. Or was that Sod's law? Both gases and liquids are considered fluids. Pascal's Law of Fluids still applies. I guess I should have read further, the example I saw was a car lift . Thinking about it I guess it sort of applies, (certainly does in a compressor tank) except that once the gas is in the manifold its not contained anymore, and its has two irregular "relief valves" in the burners, and more obstructions from one side to the other. Going back to the Compressor tank: at the tank you have great working pressure; restrict the flow from the tank (with pipes, connectors hoses etc..) and the useful pressure at a pneumatic tool can deteriorate rapidly, (which is what larger pipes, larger hoses, and less restrictive connectors help keep the tools working properly) The same principle applies here. Statically, yes the pressure will equalize, the change happens when its in motion in restrictive feeds in a flow. I'm gonna have to go with the Outlaw here. For one thing, gases are compressible, while classical fluids--think water or CF--are not. A surge tank means nothing if it's completely full of a liquid, but is a great solution for high point-load transient gas demands. Boyle's Law (basically, P1V1=P2V2) is your go-to for gasses. Restriction means the pressure takes longer to equalize between two points with the restriction between them. Use 1/2" plumbing to plumb your entire house and see what happens to the person in the shower when you open the faucet in the kitchen. They won't be happy. Use 1" plumbing and no one will ever notice. 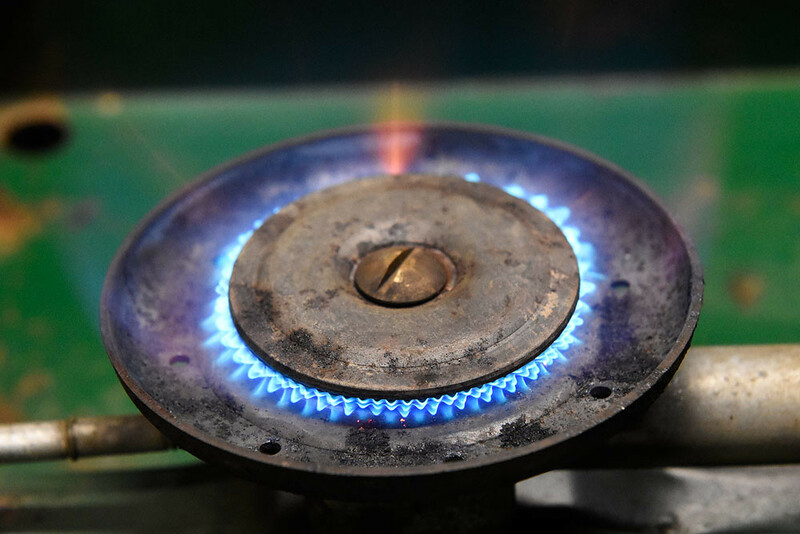 The restriction in this case--a multi-burner stove--is the generator. Sure, the pressure in the tank SHOULD be the same as the pressure anywhere else in the system, but it takes a while to get there. Not to mention, the liquid fuel is turning into a gas, which causes a very large increase of pressure in the generator tube, with the main restriction now being the generator orifice. 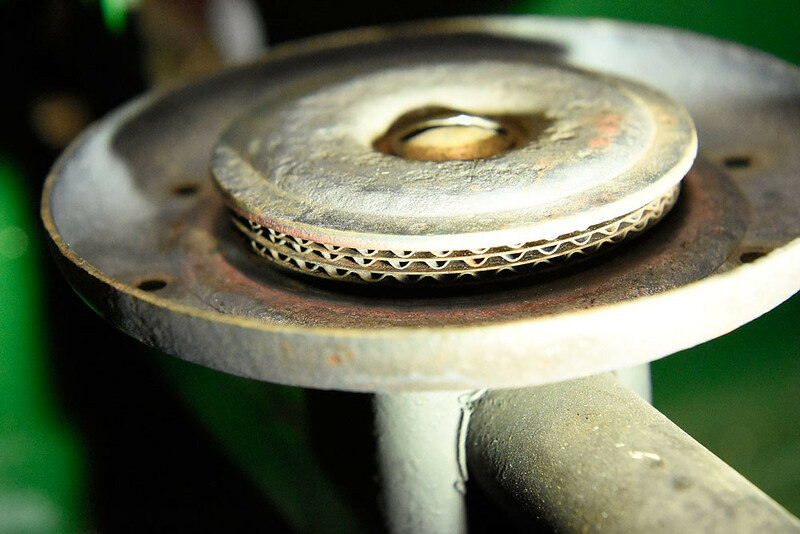 Without enough restriction in the liquid end of that gen tube, the pressure will surge back into the lower-pressure area of the tank or fount, causing surging or pulsing. But that's more a problem with lanterns. 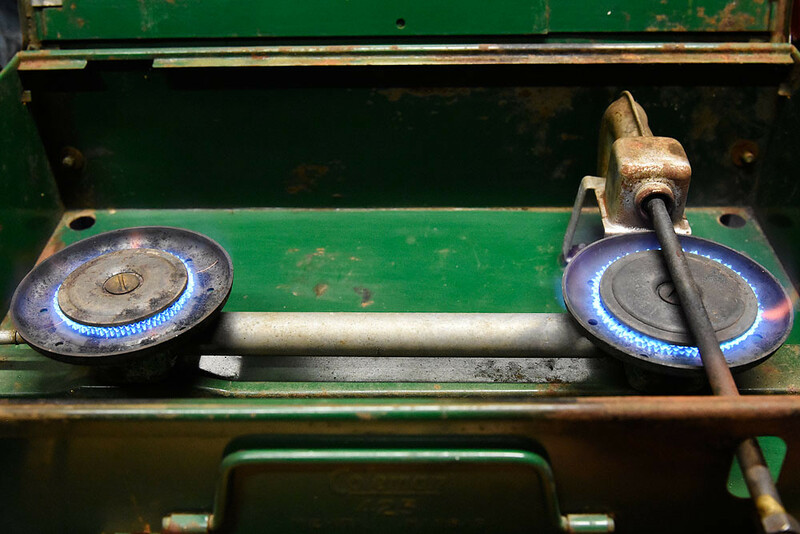 In the stove, the problem is simply that the restricted generator and orifice just can't get enough gas to the two burners to keep them both really hot. 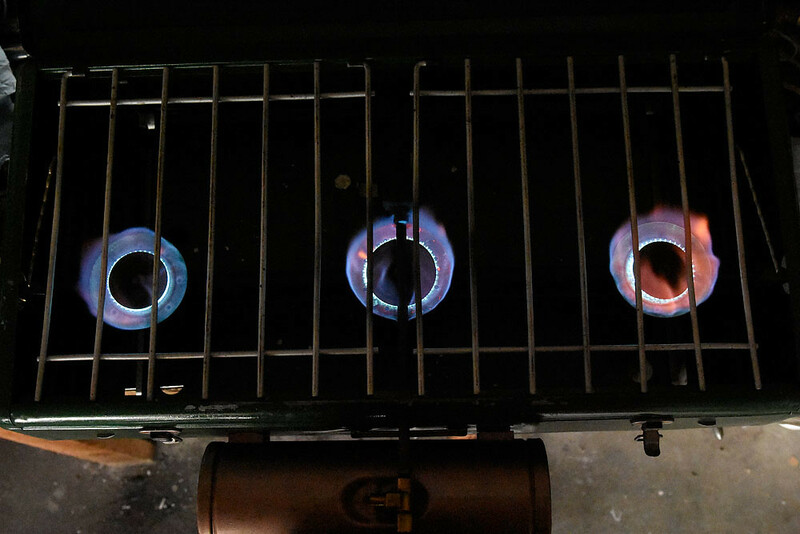 Which really shouldn't be a problem unless you want maximal heat from both burners, in which case, Duane's solution is the right one: One tank and one generator per burner. But since I simply cook on my stoves it isn't a problem for me. I like one big burner to heat water or a wok, and one or two to simmer. The way Coleman meant it to be. Except maybe the wok thing. Well if your argument is that compressible gases are not fluids and there fore not subject to Pascal's Law your argument isn't with me. It's with every accredited engineering school that teaches the subject. Since we obviously have excess to smart devices, just type in the question "are gases considered a fluid? ", and see where the search engine leads you. I see no reason to pull out Boyle's Law here to explain what we are observing. 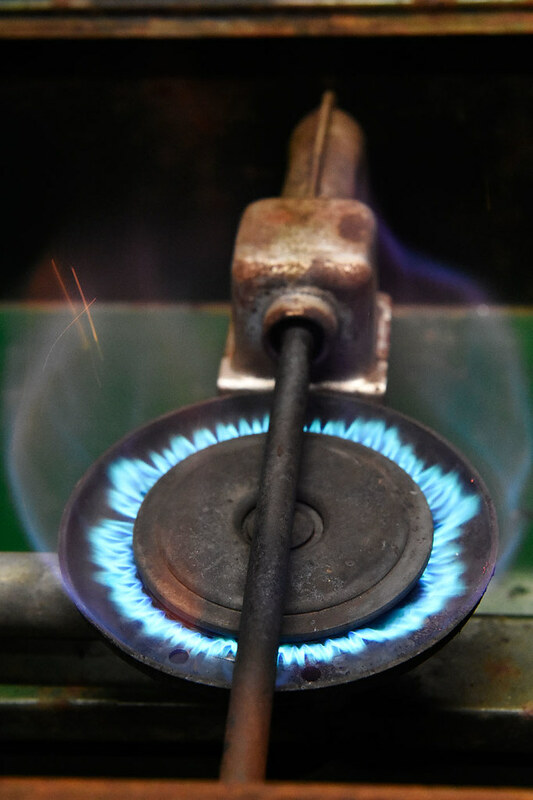 As soon as you open the path to the second and/or third burner, the pressure at the primary burner and the fuel flow rate drop. It is what it is, and like you said earlier Timm the engineers at Coleman seem to have known what they were doing. That doesn't mean that someone can't expand on Duane's two burner mod. I didn't say that Mike, I agreed after you posted, that compressed gas is subject to P's law. My point if you read closer is that once its out of the tank its a completely different thing and not P's law because its not a sealed container. Outlaw my last response was in regards to Timm's opening sentence which maybe I inferred incorrectly that since gasses are compressible they don't qualify as fluids. Yes I agree the system from the pressurized fuel tank to the burner is in no way a closed system. However the way things work I consider that from the manifold to the burner plate a pressure vessel is created when the valve on the fuel tank is opened. Not much pressure, but enough to provide enough flow of vaporized fuel and air to light it off. 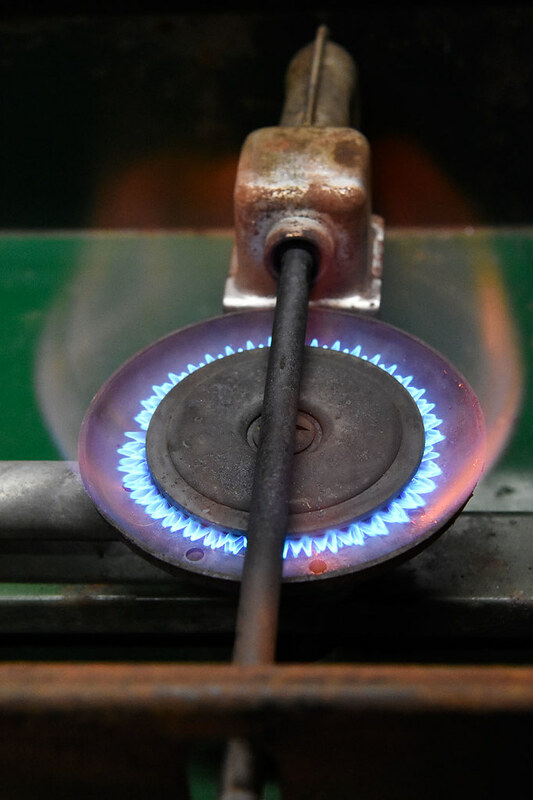 At that point the flame starts heating up the generator which among other things increases the flow rate fuel and air mixture and things move to that nice hot blue flame we all want to see. 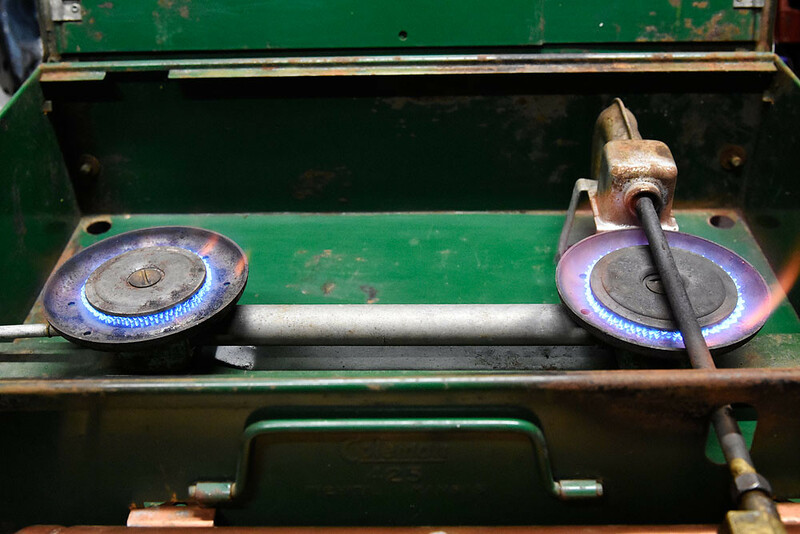 When we open the valve to an auxiliary burner I submit it demonstrates the presence of a pressure differential by the act of the fuel moving to the burner evidenced with a lighted match. Now I'm mad at Blaise Pascal, I wish I never heard of him. Considering that I think all three of us are pretty much near the same page, non of this is likely to give me the right question for a Jeopardy answer. Oh well at least it worked for me all those years I worked on pneumatic and hydraulics as well as other fluid delivery systems. If it would stop raining I might just light up a stove and drowned my woes in some pancakes. Are we ignoring the Leidenfrost Effect on purpose here? Well, I just decided that, based on your argument, air--being a fluid and subject to Pascal's Law--would work just as well in my brake system as expensive hydraulic fluid. But my brake system must not know what all engineers know. Yes gasses are fluids, but I don't think pascal applies here. It's more of an ideal gas law, as the volume increases (opening a second burner) the pressure drops.